Dr. Mikell E. Geiger Snooks provides an interesting and in-depth revelation siting, "Where the Universal Church or Body of Christ has been, is presently, and where the church is about to go"
Within the pages of Dr. Mikell E. Geiger Snooks’s new book, The Everlasting Good News of the Kingdom, ($15.99, paperback, 9781498444637; $7.99, e-book, 9781498444644) readers will discover critical information into the author’s strong belief in God’s mandate for reformation; that a change is necessary NOW. This “reformation strategy” will help Christians get into the mindset of the Everlasting Gospel, one that time cannot harness and only God can lead. He explains that when the present structure of everyone’s thinking contains ideologies that cannot bring them into the new structure that God is mandating, the only thing that can help in these times is a partnering with God as those led by the Holy Spirit into a reformation. This is where he believes the church and world currently is, and is what his thought-provoking book is all about. Dr. Mikell E. Geiger Snooks has been a Minister of the church for 30 years. He has been the pastor of Everlasting Gospel Kingdom Ministries in Columbia, SC for 21 years. He holds a Masters in Christian counseling, and a PhD in Theology, from a South Carolina local community Bible College. He has been and ordained pastor by a Baptist Association; ordained Apostle in Abak, Nigeria; and ordained Apostle in Columbia, SC. Xulon Press, a division of Salem Media Group, is the world’s largest Christian self-publisher, with more than 15,000 titles published to date. 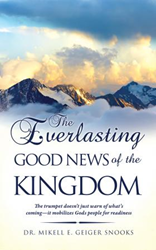 Retailers may order The Everlasting Good News of the Kingdom through Ingram Book Company and/or Spring Arbor Book Distributors. The book is available online through xulonpress.com/bookstore, amazon.com, and barnesandnoble.com.